The National Center for Biotechnology Information (NCBI) Gene database is a free online resource for gene sequences from many species and phyla. The NCBI gene database includes gene sequences, gene alleles and mutations, genomes, pathways, protein sequences and so much more. If you are new to the NCBI databases there is a wealth of tutorial help both on the NCBI website and elsewhere on the web (e.g. NCBI Gene & SNP Tutorial). Below is a list of tips that will help you maximize the benefits of using this powerful research tool. How your data fits into the larger picture is a question that every researcher needs to ask. There are tools on the NCBI website that can help answer these types of questions. 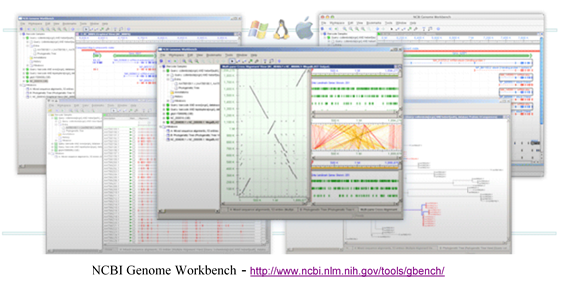 One such integrated tool is NCBI Genome Workbench. You can use this tool to view your data in multiple ways and analyse it together with data from public databases. The tool provides various alignment views, tabular views and even phylogenic tree views. Finding published data about your gene is vital in research. All of NCBI databases are integrated in many different ways. You can search for articles about your gene using the gene name, symbol or sequence accession number. You can also use this link for a more detailed explanation on how to conduct and optimize your NCBI searches. It might sound a bit counter-intuitive providing the government (NCBI is part of the NIH which is part of the US Department of Health and Human Services, and the .gov is a dead give away) with your search information. However, unless you are searching for making weapons grade anthrax, the benefits far outweigh all your fears. Regardless, they know everything about you anyway. 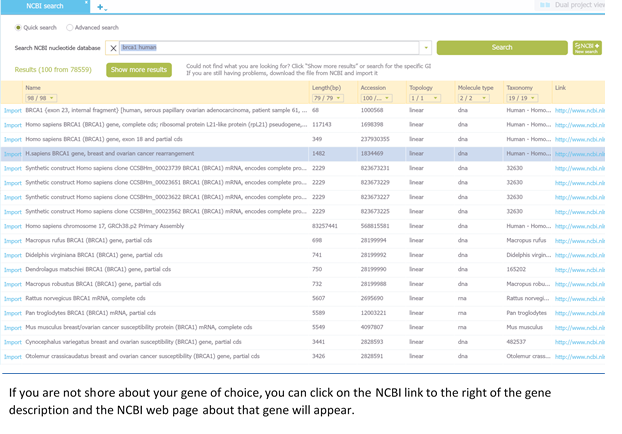 In all seriousness, by using My NCBI you can save searches and results from multiple NCBI databases, select display formats and filtering options. My NCBI has an option to automatically update and e-mail search results from your saved searches. In addition, there are other features that help you save your citations and manage peer review articles. You can quickly learn more about My NCBI with this tutorial. With the explosion of scientific information published daily, most search queries will give you multiple hits. Narrow the list and retrieve more relevant information by using filters. On the results page after your initial search on the upper right corner you will see a manage filters tab and on the left there is a “show additional filters” tab. You can filter your request by gene sources, such as genomic or mitochondrial, by specific properties such as records with an associated RefSeq record or records that encode a protein sequence belonging to a consensus CDS (CCDS) set. 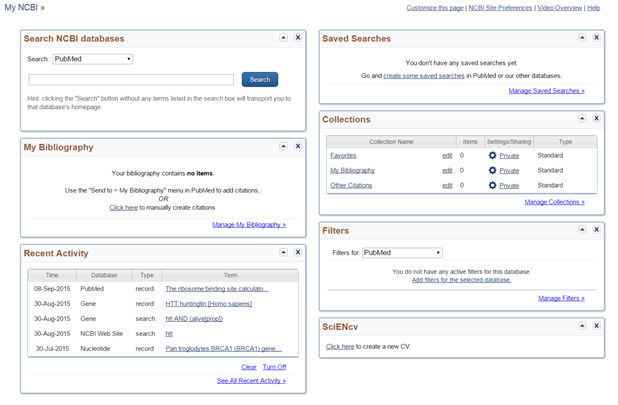 NCBI has four main categories of filters: Popular, LinkOut, Properties and Links. The "Popular" category gives the most frequently requested filters for each NCBI database. The "LinkOut" category provides additional supplemental information related to NCBI database group records. This information is from non NCBI organizations, such as full-text publications, biological databases, library holdings and research tools. The "Properties" category arranges records according to specific criteria for each database, such as biosource, molecule type and RefSeq for nucleotides. The "Links" category groups records that have links to other NCBI databases. By selecting "Links to Gene" a result link will group all records retrieved in a search that have links to the Gene database. Read more about NCBI filters. BLAST is to the nucleotide or protein sequence database as a good search engine is to the internet. 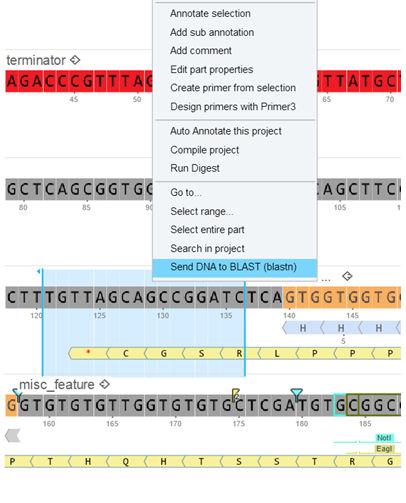 BLAST or Basic Local Alignment Search Tool is a sequence alignment tool that allows you to identify an unknown sequence, map a sequence in a genome, get clues about related sequences and more. 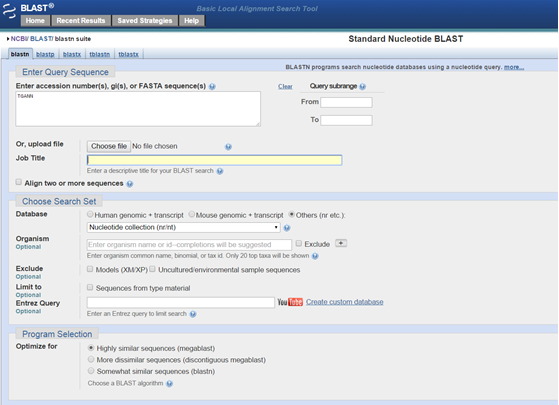 You can also use your gene sequence to search protein databases using a translated nucleotide query in the blastx option. Although you can query your sequence against the complete NCBI database it will take time and the alignment might not be optimal. BLAST is like doing an experiment. Therefore, you must optimize the experimental conditions to get good results. Too wide a search can take a long time and give you many random and meaningless matches. Too narrow a search will possibly miss significant matches. You can also use many specialized BLAST searches such as making specific primers can be found. Read more about BLAST. Usually, after searching NCBI’s databases and finding the correct gene sequence, you would save it in either Genbank or Fasta format, download it to your computer and copy and paste it into your DNA designer software. This is both time consuming and prone to copy paste errors. 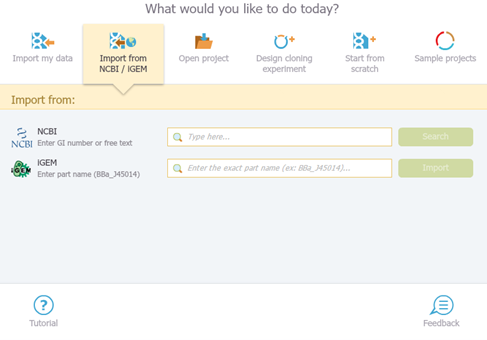 Genome Compiler, a leading DNA design & visualization, data management and collaboration platform, offers the ability to directly import your desired gene from NCBI and use it as the starting point for your research. From the main menu in your Genome Compiler you can directly query the NCBI database – in a way that allows you to save time, avoid mistakes, and simply work more efficiently. Here's an example for human brca1 gene. Searching for this specific gene will open the results list you can directly import from without coping /pasting from NCBI. 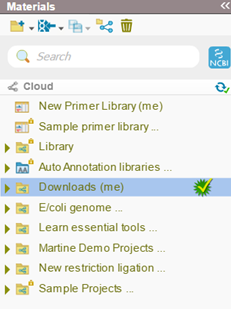 Once importing the desired gene, Genome Compiler will automatically save it on the Downloads folder in its convenient Materials Box, from which you can locate it any other folder you have created in the Materials Box. In addition to that, you can also select any sequence while working on Genome Compiler software, and directly send it to BLAST. Read more about NCBI search on Genome Compiler or watch the searching and NCBI tutorial video.